December is always a wild ride right up until Christmas Eve when time runs out and exhaustion puts the brakes on. The end of the year and the holiday rush forth like encountering a 67 car pile up in the fog. It sort of blindsides you even though you are expecting it. Everything was running smoothly right up until Halloween. I had a handle on it all right down to the costumes, the candy, and the events. The next day I would be locked in to "my project." It was a commitment to write 50,000 words in thirty days. It could be a novel or memoirs or whatever but you HAD to get 50,000 words written. Can you say I didn't write every day? I didn't and couldn't due to just life and work and home duties and such, but over the course of those thirty days (some long nights saw an 8,000 word wandering) I managed the 50,000 words. To my shame that didn't complete the project which is basically a history of my life along with character sketches of the people in my family that my daughter will never know. It's a gift to her that if I ever finish it, she might read when she's forty or so. Also over the last three months, computer viruses have been shall we say rather virulent. I had my very first in August and it scared the pants off me. I learned to be diligent in my daily updates and wanderings. Then I had my second incident in late November. That was it, the company that I paid money to allow me constant updates I cancelled. It was time to call in the big boys and pay the serious bucks for real protection. It was time for Norton. Not only did I ascribe to the anti-virus and the system cleaners, I went whole hog and got a firewall as well. I felt totally exposed and didn't like it. So, coming home from Thursday evening's foray at the local mall after a round of Christmas shopping I was met with FedEx delivered software of the latest and most powerful. For the bucks it should have been. I had wanted to wait until the next night as I never made it to the grocery store either. It was after 7 PM and I was totally pooped. Let me just feed the dog, ignore the mess in the house, read a couple of chapters of my current book and allow me to drift off into the sleep of the exhausted. That wasn't to be. Hubby embraced the idea that I'd enjoy installing the software and getting all up to speed. These weren't little programs or games. This would take more than installation but configuration as well along with the odd tweaking. I knew it was hours in the making but I went ahead. Little did I know what I was getting myself into. At 8 PM I began loading and installing it all. Then began to twiddle with it. I cleaned up my files, defragged the hard drive and set my firewall settings. Then I went about checking how it worked. That's when my email decided to "load" on a basis that seemed endless. Something was wrong here. What had I done? Apparently something. By midnight I had uninstalled the firewall and STILL couldn't get the email to work. I puzzled and puzzled with a now-muzzy head. It was time to give up. So I did. The next day was more work and more shopping, this time for quick Christmas gifts and then groceries. Once home and family fed and the laundry begun, I settled back into my chair to face the computer again. I knew I had to make this work. I tried again with the same results. Next I disabled the anti-virus software and still the endless "loading" of the email. Then I uninstalled the anti-virus and met with the same thing. It was obvious that I'd done something awful to my email program. Time to hop over to the Microsoft site for the latest update for my browser and email. That was an easy hour or so. Then I tried it again and went into my email "naked." It was a fearful moment. I hit the button to load the email and then watched the progress. It began right away but that 1st email was enormous, 5 ½ MB. The realization that it wasn't the software or anything I'd done was a huge relief. The wasted hours seemed funny now. After I finished laughing, the email was still loading. Just who had sent me this big thing and what was it? Was it a virus? Was it a joke? Was it some funny picture site? Whatever it was I decided I didn't want and I was decidedly NOT happy with whoever sent it. Did they have any clue to what they'd put me through these last two nights? Not likely. Twenty-five minutes went by and with each minute I became more vocal about my displeasure. Finally the rest of the 115 emails loaded too. I had promised myself that whoever sent that first one would feel my ire. My anger dissipated within seconds. That big file came from my cousin. No, it wasn't a phantom virus or a joke. 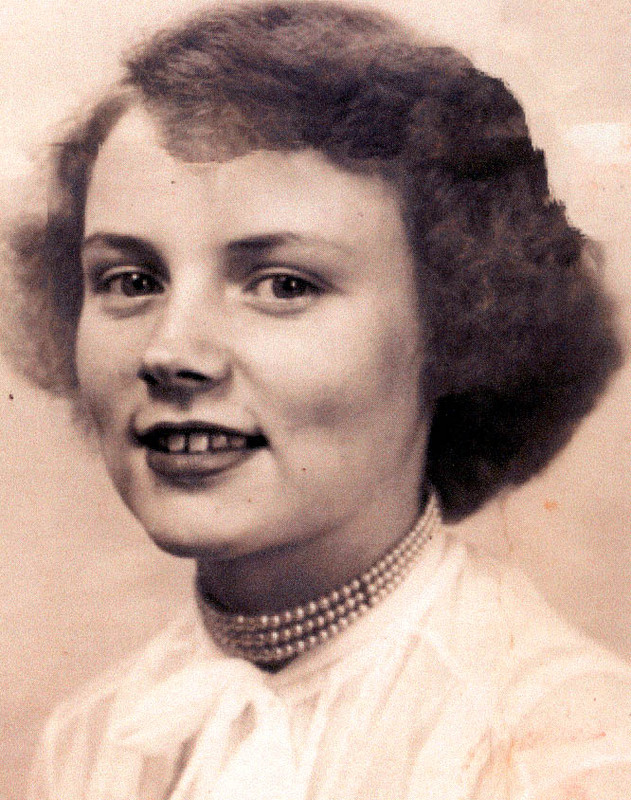 It was a picture of my mother about the age of 17 or so that my cousin, Anne, had worked very hard to restore. Her text was loving and kind. I felt so sheepish and stupid. Had I picked any other night for this I would have realized what was happening, but life has forces of its own and when they converge we end up spending time chasing our tails. I had to laugh at myself and wish my cousin was with me so I could hug her. She had taken the time to restore a picture of my mother who I miss very much and don't have very many photos of. That picture is the best gift I could ever receive. Annie, thank you so much. You can't know how much I thank you and appreciate your efforts and time.